What Shall I Take to Gellert Spa? Home / Gellert Bath FAQ / What Shall I Take to Gellert Spa? 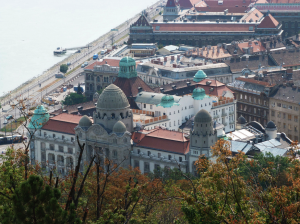 Plan your visit to Gellert Spa with our quick guide, and take the most important necessities with you to enjoy a relaxing thermal bath visit. What Shall I Take With Me When Visiting Gellert Spa? Towels – Towels can be rented in Gellert Spa (link), but we suggest bringing your own towel, as the deposit for the towels are set quite high, the waiting time can be long, and you need to keep an eye on your rented towel to get back the hefty deposit fee. Food and drink – You can bring your own drink and food to the Spa, but we also have a buffet with cold snacks and drinks. Other personal items – comb or haidryer, suntan lotion, body lotion, etc. Other valuables, like cameras, wrist watches, etc. In case you do need to carry a valuable item you can rent a safety box in the baths. I’m coming to Budapest this week (from the UK) and am interested in coming to the Gellert Spa on my first day. As my accommodation check in time is later, I was wondering if it would be possible to bring my little suitcase with me? I was going to book a cabin, and complete the booking today but i just thought i would check I could be bring my case with me. We suggest the tickets with cabins for you. The cabin is like a tiny room, or cubicle, which can store a standard check-in suitcase easily. The cabin size is approx. that of a dressing room in a clothes shop, so you can leave there the 20 kg suitcase as well ( if it is a regular size) along with your jackets etc. The size of the locker is 120x30x65 cm (1200 x 300 x 650 mm), we assume it is too small for your bags. You say that I should take with me a printed confirmation email of my online purchased bath entry. However, I do not have a printer. Is it okay if I only show you my email? yes, of course, you can show the email on your phone when checking in. Hello, I wondered if I buy tickets for Monday, Dec 17 online, will I be able to cancel or reschedule if our plans change? yes, re-scheduling is possible minimum 24 hours in advance.